On Memorial Day, we went to our friends, Trisha and Ben’s house for the day. Trisha and Ben have four kids: Jake (almost 6), Joe (4), and Addie and Lexi (twins who are 1 today!). These are Eddie’s very best friends. He was excited for days to go over to their house and play. I think some of it had to do with the fact that he knew he would get to skip nap, but most of it had to do with playing with Jake and Joe. And then I told him we were bringing his swimsuit and his head almost exploded from the excitement. The plan for the day was that we would get there around lunch time and Cort and Ben would head over to Trisha’s parents’ house to work on their pool area while Trisha and I stayed back with all six (SIX!) kids for the afternoon. So the menfolk put on their grubby clothes and left. 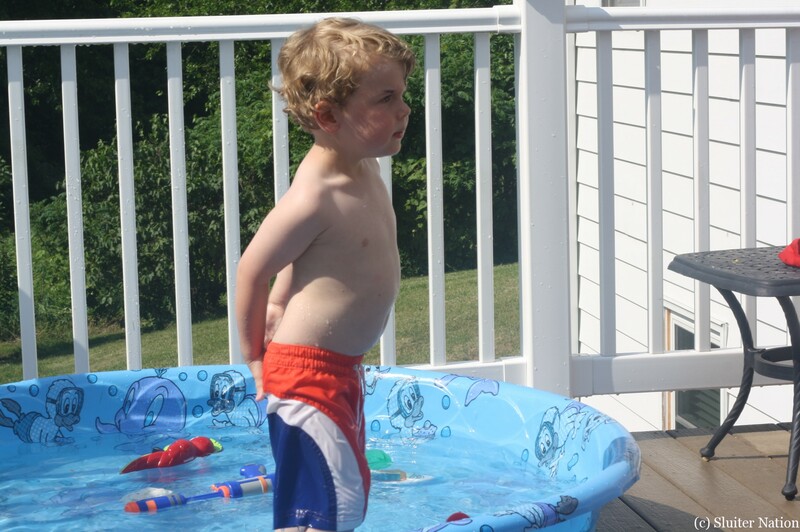 Trisha and I immediately put bathing suits on the big boys and sent them out to play in the kiddie pool in the deck with squirt guns and torpedo shark thingys. I decided I was not dealing with a diaper–swim or otherwise–on Eddie that day. They boys had so much fun in the pool. 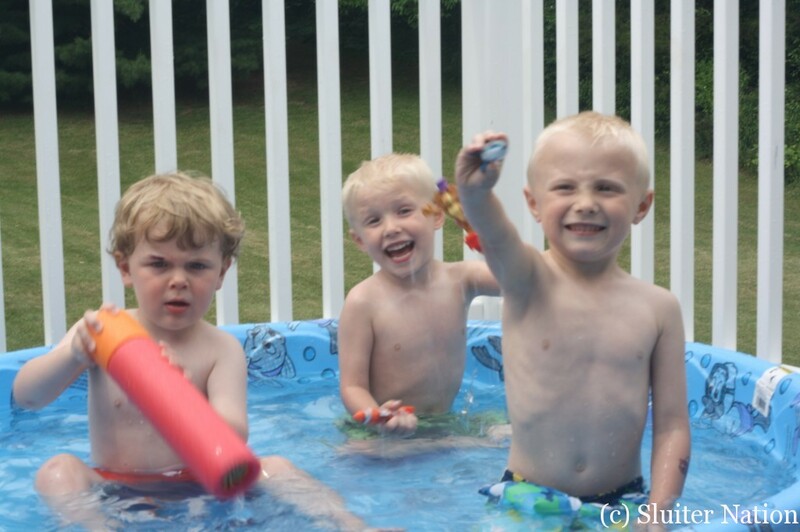 While there was quarreling about who got the squirt guns and who had which shark torpedo, they were non-stop moving and having fun. Trisha put the twins to bed and I fed Charlie. Then, because Charlie likes to “play” for a bit after he eats, we found a spot on the floor just inside the sliding door so I could still chat with Trisha, but be out of the sun with Charlie. And off he ran to play. About 15 minutes later, he worriedly tells me again that he peed. I reassure him. From that point on, he doesn’t tell me anymore. But I do notice something. Every 15 or 20 minutes, he steps out of the pool onto the deck, bends his knees slightly, and lets pee trickle down his legs. At that point, I try to tell him to go down to the grass to pee, but he never does. Instead, Jake and Joe realize what he is doing and it becomes a game to “clean up Ed’s pee” with the squirt guns each time. I start to apologize to Trisha and wonder if I should put a diaper on him. She doesn’t seem to concerned, so I let the peeing continue. And then something new happens. All of a sudden, Joe stops what he is doing and liquid trickles down his leg. Then later, Jake does the same thing. A four and a six year old peeing on the deck. Two boys who have LONG been potty trained and have never peed on the deck before. I am sort of sure Trisha is grossed out, but I can. not. stop. laughing. It was very quickly going from pool party to pee party. When Cort and Ben got back from their day of hard man work, all the boys were super excited to tell them about their day. Did they talk about squirt guns and shark torpedoes? 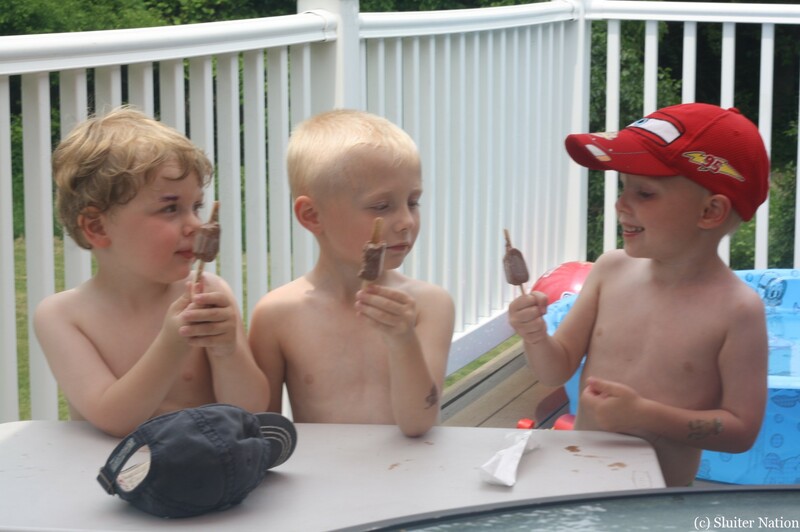 Or about the fudgecicles that Trisha gave them? Nope. They were most excited to talk about the deck peeing. Eddie’s first adventure without a diaper turned into a pee for all. Next week Friday begins the REAL potty training.